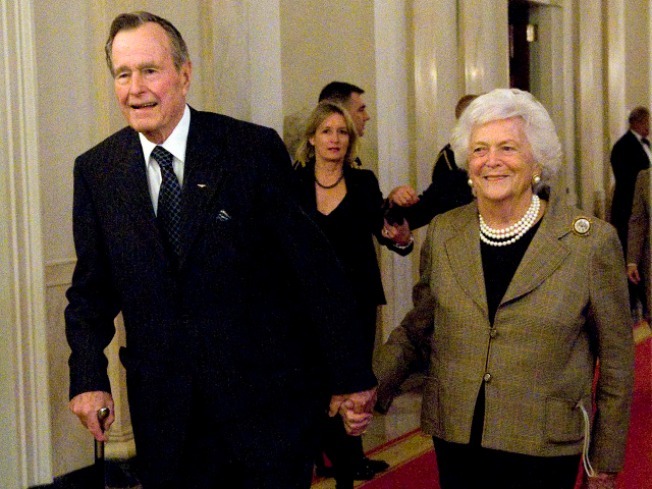 George and Barbara Bush won't make it to Ted Kennedy's funeral, but there son, former President George W. Bush, will. Former first lady Barbara Bush has been hospitalized in Houston for tests after not feeling well for several weeks, NBC News reported Saturday night. Sources told NBC that Mrs. Bush’s doctor checked her into Methodist Hospital to run tests. The problem was not believed to be related to her heart or the aortic valve operation that she underwent in March 2009. Doctors hoped to let her go home Sunday or Monday, NBC reported. Mrs. Bush, wife of George H.W. Bush, underwent surgery a year ago to have her aortic valve replaced by a valve from a pig. That surgery was performed because she was suffering from a severe narrowing of the main valve. Barbara Bush underwent surgery in November 2008 for a perforated ulcer. When she lived at the White House, Mrs. Bush disclosed she was suffering from an overactive thyroid ailment known as Graves' disease. The disease causes teary eyes and double vision, according to her doctors. This article is based on reporting by NBC News’ Jamie Gangel.